Model 3412 MD-GAC Tube Expanding and Swaging Machine : American Machine and Hydraulics, Inc. The model 3412 MD-GAC is an economical tube expanding and swaging machine. It is self contained motor driven, hydraulic powered. It is portable and can expand with the micro dial from 11/2 (38.1mm) up to 3" (76.2mm) with the mechanical gripper clamp. It can expand, reduce, flare, flange or bead. This unit has a mechanical clamp and will leave some clamp marks on the tube. It is ideal for low production work where cosmetics are not a major factor. Tooling changeover is only a matter of seconds. 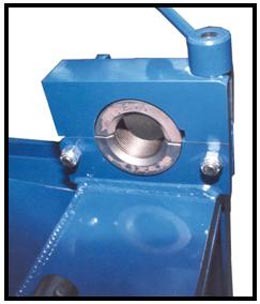 This unit will generate 14 tons of swaging forces and 12 tons of expanding forces using the micro dial system. The micro dial allows for precise expanding while the gripper clamp utilizes double tapered collars.